As the title says, has anyone got this feature working? It can be enabled in the BIOS under Power Management - using latest FW version (1.5.0). I have enabled it and when inserting the AC adapter plug when the laptop is OFF, the front white LED turns on for a second or two and then goes off - laptop does not power on. Unfortunately, without opening the lid you can not access the power switch. The Latitude line have a docking station that will support a power swtich outside the computer, but I'm not aware of one for the XPS model. But what is then the purpose of this BIOS feature? It seems to not work correctly. 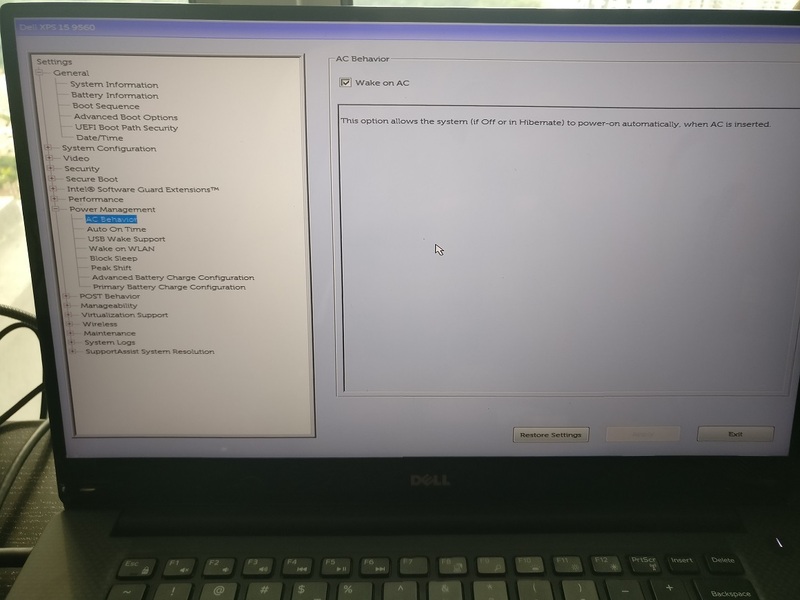 I've checked the information for this computer, and I see no settings for power control in the BIOS, maybe a feature of the OS, but I'm unable to find anything that indicates power can be turned on by the BIOS. Here is a photo of the BIOS showing the feature - are you able to find out more and if it is actually supposed to work? OK, so I guess the for the "Wake on AC" feature to work, a time for the computer to wake from power-off must be set? I think I misunderstood the feature explanation: "...when AC is inserted" -> I assumed that meant at the point in time when the power is plugged in physically, the machine will power on.